The BAR manager called. He said that my SPCNS had been approved and that I’d have to make an appointment for a follow on inspection. Also to make sure that I have a PCV valve fitted (which I do). I made the follow on appointment only after I got the diff seal fixed – its set for 7:20am on August 15th (Thursday). 33-10-7-505-603 78mm 44mm 10mm <—this is the one I need. 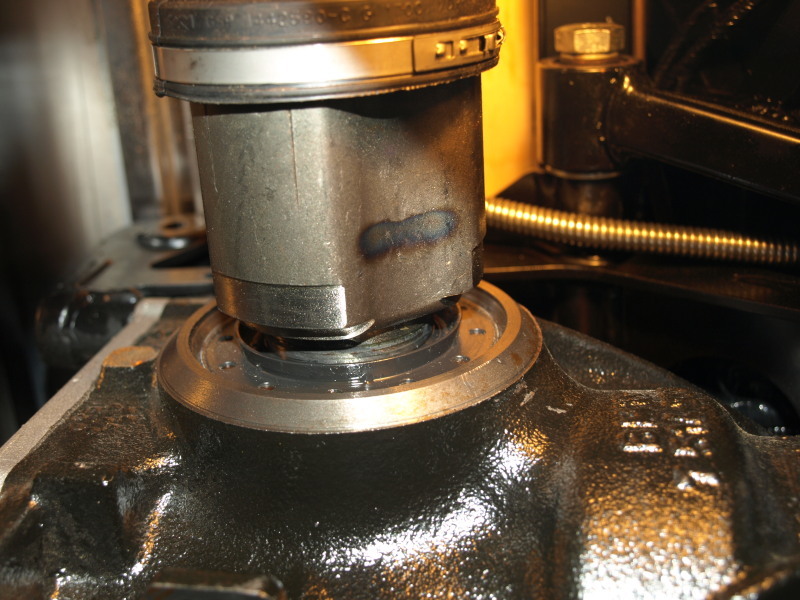 I had mentioned earlier that I’d seen oil coming from the dif, so I had a closer look and it appears to be coming from the right side shaft seal. Here’s a picture, but you can’t see much. Talked to Jon at Caterham & he told me that the differential is made by BMW for a series 1 and the fastest way to get one would be to go to a BMW dealership. So I ordered a couple of seals online from a BMW dealer in Phoenix. In the meantme, I topped up the oil level in the diff, it seemed to take a lot – but it was with a squeeze bottle & 3/8″ tube. Part number on the diff is 7514992 – this is not recognized on the BMW website, but when searching on google, it recognizes it as a BMW differential. The seals arrived this afternoon. I inspected one and it looked the same and the ID fitted exactly on the (throw-away) shaft that I had previously removed from the diff when I installed the drive shafts. So, about 6pm I set about replacing the seal. 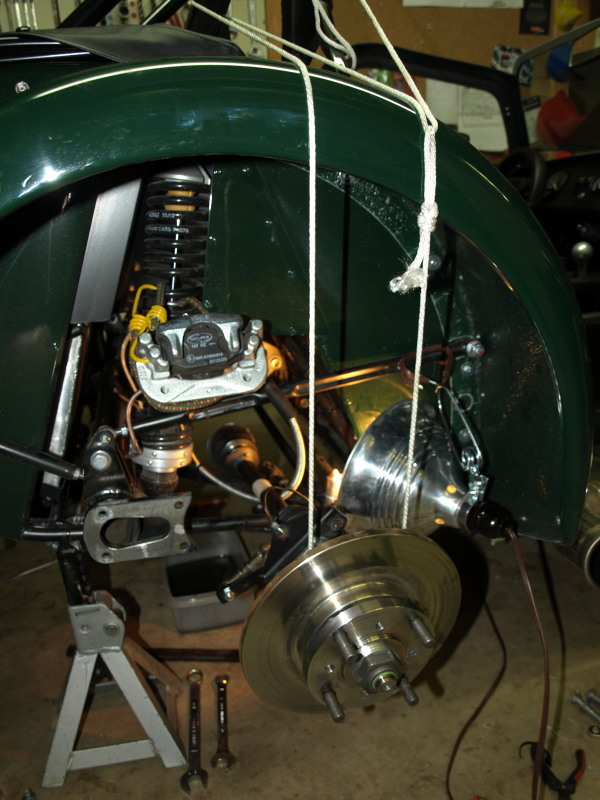 Removed the RR wheel, then stripped off the disk caliper assembly & hung it by a bungee cord. Disconnected the anti-roll bar attachment and then undid the 4 bolts holding the de-dion ear to the de-dion tube. I hung the hub assembly by a rope from the roll over bar. The driveshaft slid out of the diff with a slight tug. I inspected the seal, but saw nothing major wrong with it. Anyway, I removed the seal (destroying it in the process) – these things don’t come out easy! I went to fit the new one – but the outside diameter was too big – see picture. New one on left, old one on right. 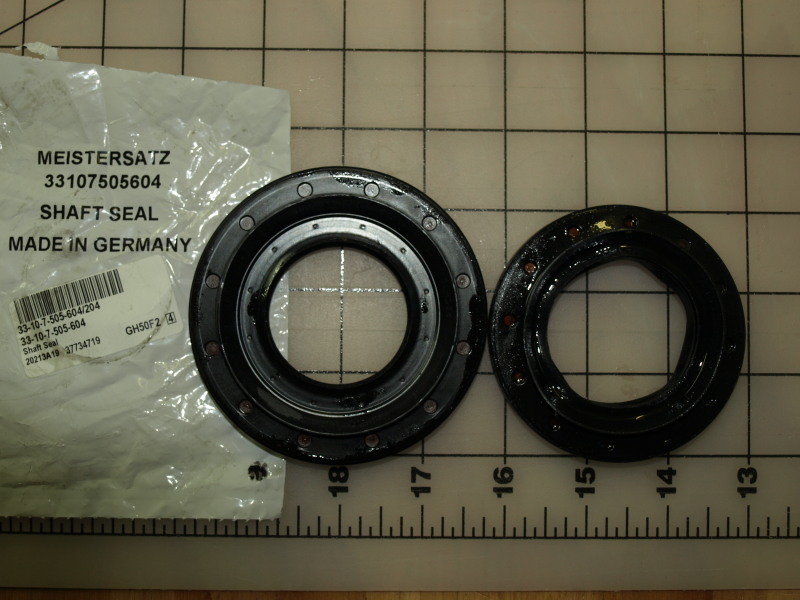 The BMW part number for the seal is 33-10-7-505-604. This part is supposed to fit most/all 2012 BMW series 1, and specifically the 128i. I guess they use a different differential to mine. So my car is sitting on jack-stands awaiting a new seal – I sent an email to Jon to order one, he has none in stock – it’ll have to come from Caterham UK, which may take a while. I finally connected with the manager at BAR. He told me that they were waiting on one inspector to return back to work this Thursday. This inspector needs to look over my paperwork. He said he’d call me back on Monday or Tuesday next week. 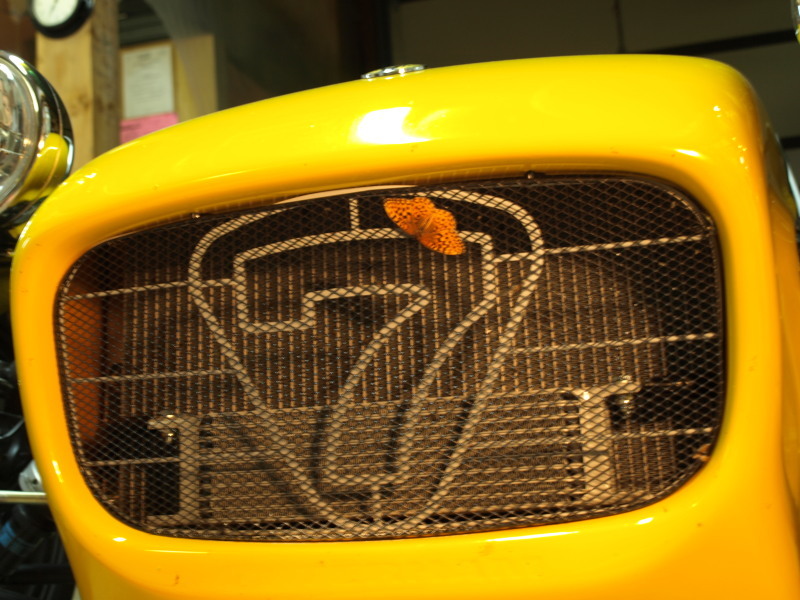 Found this butterfly on the front grill after the Sacramento trip. Progress in some areas, not in others. While I was optimistic that I’d found a fix for the speedo, it started mis-behaving again. Dot & I drove to Sacramento for the smog referee inspection. We took I80, because we wanted to get there in plenty of time. 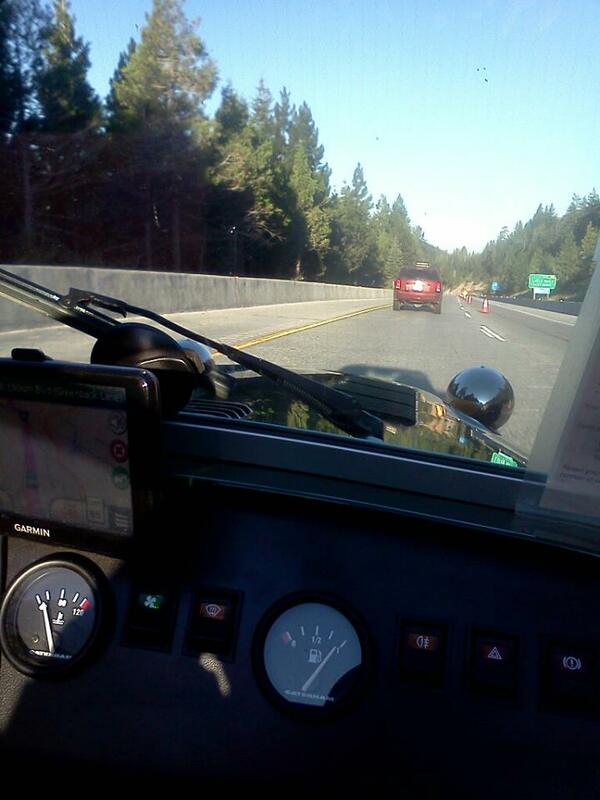 Driving I80 to Sacramento. Note the temp gauge – not good. We both wore helmets to protect from getting hit with flying debris. It was not so comfortable as the seat back headrest gets in the way of the helmet & you’re forced to tilt your head downwards. 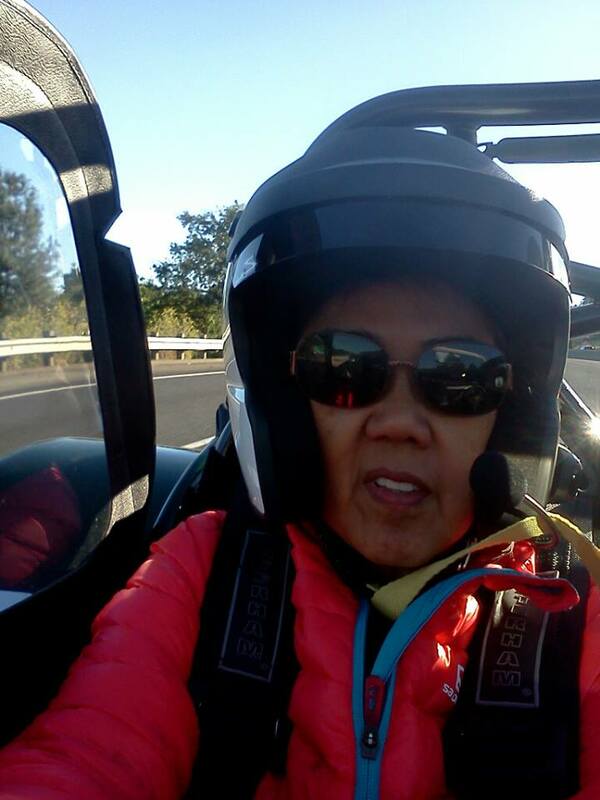 Also quite claustrophobic with helmet & gloves inside a tiny car. But, the car behaved well & the speedo worked fine for the first 60 or 70 miles until the engine/day started warming up (more about this later). The engine coolant temp was at around 50C for the first 40 or so miles and then it came up to the normal range 90C-95C. I wonder if that big radiator is over-cooling the engine especially in lower temp weather. Come to think of it the fan very rarely turns on. We found the referee office at the American River college fairly easily, 30 minutes early, so we went out to McD’s for some breakfast & coffee. I called the referee phone number in the office as instructed and he showed up a few minutes later with his assistant. He wanted to see the paperwork (DMV, CHP, receipts etc.) which I provided. He wanted to see the VIN. Then he took lots of pictures and excused himself for 45 minutes to inspect the paperwork and make copies. When he finally came back, he said they needed more time to review the information and provided a letter stating that I need to reschedule another appointment at a later date. I was shocked, no reason given, no advice on whether the car was plumbed OK, no defective items pointed out. So a day wasted and a 250 mile round trip for nothing. Bummer. So we left and headed for Placerville, where we met up with my old buddy Sal Dioro at Starbucks and spent an hour or so catching up. We then headed home via Mormon Emigrant trail to Hwy 88, on to South Lake Tahoe & then home on Hwy 89 along Tahoe West shore. The first 2 roads had almost no traffinc and were windy in places, so it was a great drive back. The traffic started as we got close to South Lake Tahoe and the fun was mostly over. Now, most of this time the speedo had gone from intermmittant to non functional (pegged at 0). So, think, think – it only goes wrong when it gets hot. So to try and prove this, after we got home, I waited a couple of hours and set out at 7pm – speedo working fine! I slept on it and decided to go out in the heat of the day armed with a can of freeze spray (used for diagnosing electonics circuits). This afternoon (hottest part of the day), I went for a drive up to Cisco Grove on old Hwy 40. As usual, when cold the speedo worked fine and continued to do so for about 25 miles, then started to go intermittent. I drove another 5 miles to make sure it was truly intermittent, then pulled over and thoroughly doused the speedo with freeze spray. Turned around to head home and the speedo was working fine, for about 6 or 7 minutes, then it started to go intermittent. More freeze spray, and its OK again. Repeated 4 or 5 times on the way home. So I think, I’ve proven that there is some heat sensitive component in the speedo, that is failing when it gets to a certain temperature. This is a typical IC failure symptom, as I’ve used freeze spray to identify faulty components on circuit boards in the past. 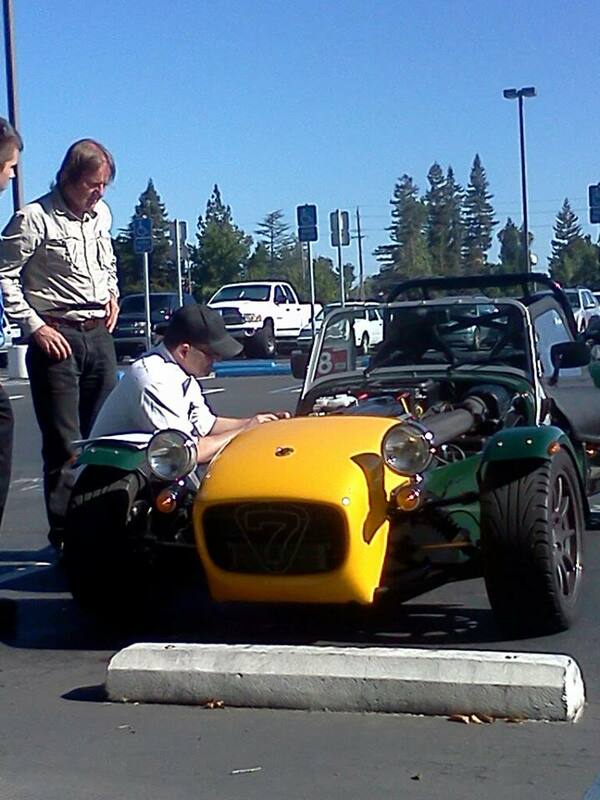 I had gotten feedback on the speedo issue from Jon at Caterham in Denver. He thought is was an electrical connection problem & asked me to check all connectors and check that I had a good ground. I checked, connections were good. I installed a 2nd ground strap from the battery to the chassis. 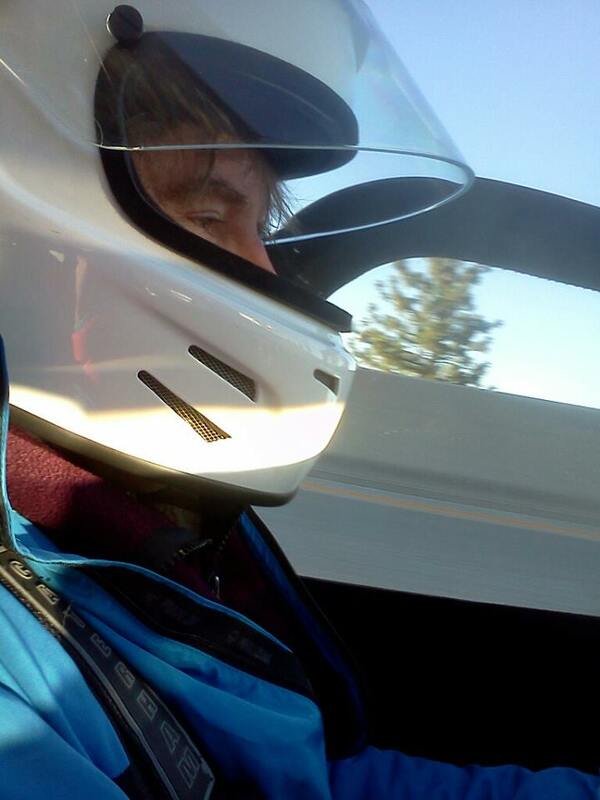 This morning, when I set out, first time of the day and cruised slowly to the freeway & slowly accelerate up to 70mph, everything seems fine – the speedo indicates true speed & no flickering. I drive 3 miles to downtown Truckee & do some errands. On the return trip, cruising 1/2 mile to freeway, speedo OK. On the entrance to freeway, I punch it, getting to 70mph quickly, and the speedo is intermittent (flickering around the 20mph range). On leaving the freeway, stopping, then driving at slower speeds and lightly accelerating the speedo seems to perform better, but I’m still seeing some flickering. More feedback from Jon: ” It really sounds like a loose or partially broken connector somewhere. You might want to try to isolate it by removing the speedo from the dash and then reconnecting it underneath the dash so you can hold it in your hand. Find a safe place and drive the car and move the connector, shake the speedo, etc to see if the problem is there. I have found a badly spliced wire in the little rectangular plugs on the speedo before”. So, I unplugged & removed the speedo, checked the connectors and plugged it back in. I checked the speedo casing and measured the resistance to ground and got an infinite reading. So the casing is not connected to the ground wire on the plug. To be sure, after I installed the speedo back in the panel, I ran a crocidile clip cable from the speedo casing to ground. Had a 7am appointment with the dentist in Tahoe City, 20 miles each way. It was cold, next time I’ll wear gloves as well as a jacket, & maybe a scarf. The speedo behaved perfectly on outbound & return trips. 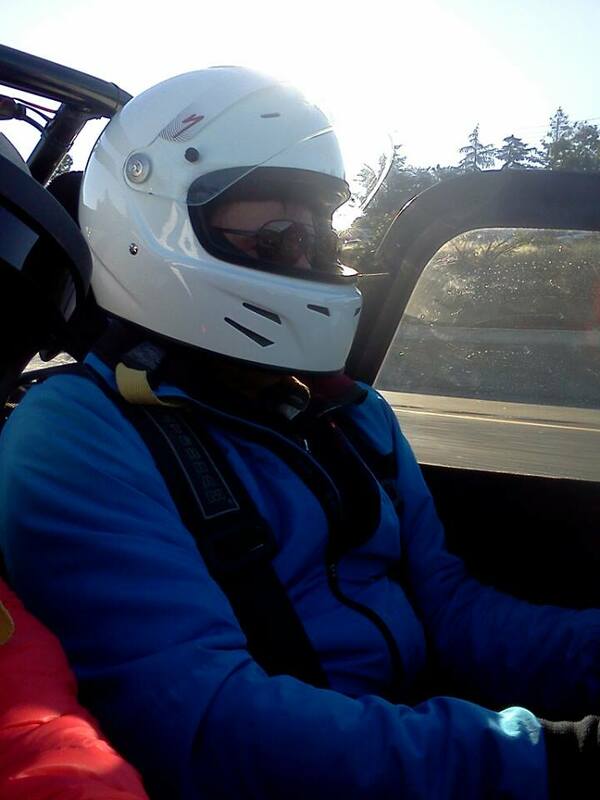 Noting that I drove smoothly without violent accelerations. I checked that the heater works, not too hot, but when I turned the fan on, the engine temp guage went down. Which may mean I’m over-cooled. I noticed a few drops of oil on the garage floor (again – I’d seen this before as well). Appears to be coming from the diff. I wonder if this is due to it being full just after I installed it and the excess oil had not fully drained to the level when I re-fitted the bung. Tomorrow, I have to drive to Sacramento to have the smog referee inspection. This will be the first long drive. We’ll see how we get on.